Shouldn’t picking up the core language skills be much more difficult than learning the workflows AROUND the language? The trouble is that the “difficulty distribution” for modern software development with Python is shaped like an iceberg. And knowing your way around Python “the language” is just the tippy top of the iceberg. That’s all challenging stuff for someone just starting out. But it’s also VISIBLE in plain sight. • They don’t know their way around standard tools like pip, virtualenv, or PyPI and it sabotages their productivity. • A lack of experience with the tools and the ecosystem surrounding the core language slows them down. • They lag behind other developers because of “re-inventing the wheel disease” and not knowing how to find and use quality Python packages. Because these problems are invisible at first and quite counterintuitive, many Pythonistas are missing an important part of the puzzle. From personal experience I know it’s easy to focus on the tip of the iceberg that’s visible in plain sight—while completely ignoring the GIGANTIC MASS underneath. 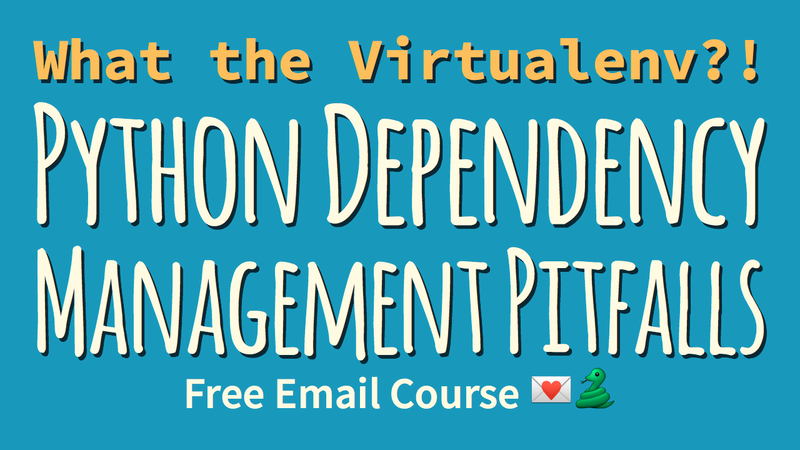 In this short & sweet 5-day email course I’ll show you some of the main pitfalls with dependency management in Python—and how to avoid them.